Property owners sometimes fail to file insurance claims because they do not recognize the signs of damage. 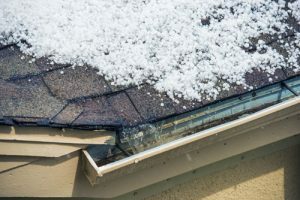 This is often the case when wind or hail damages the roof or siding. Over time, the damage can and will continue to deteriorate the roof system or infiltrate the house’s siding, causing interior damages that cannot been seen. If a storm comes through your area and you suspect damage, contact E3. We’ll send an insurance restoration specialist out to conduct a free, no-obligation inspection and identify what, if any, damage we find. Our fire and water damage division prides itself on our response time and attention to detail. Assessing the damage is not our only focus, however. We know that restoring your home and its contents can be a daunting task, but E3’s team of experts can handle major catastrophe claims and help you feel safe in your home again. If you’ve encountered a fire or roof-related water damage, contact E3. A team member will conduct a thorough property inspection with you and then help you through the insurance process. The first step to the insurance restoration process to determine the extent of damage, if any, to your home or business. Our trained specialists will identify damage on your property and will explain to you the simple steps in filing a claim. The insurance company is the final decision maker about how much of your property is damaged and what compensation you will receive. Our job is to negotiate on your behalf in this process, addressing items such as items damaged, measurements, and dollar amounts. E3 Roofing and Remodeling will even be there for you during your adjuster meeting. A “loss” refers to property damage. And the “loss event” is what causes the damage. Your company needs the date damage occurred to your roof to file and process the claim. E3’s restoration specialist will help you determine the date if you are uncertain. E3’s restoration specialist will provide a free, no-hassle inspection of your property. They will document the interior and exterior of your property and call the claim into your insurance company if damage is found. Your insurance company will set up an adjuster meeting time and date with you. E3 will bring its list of the damages to this meeting and make sure the adjuster overlooks nothing. It is our job to communicate with the insurance company at this meeting so you can get your roof back to its original condition. Actual Cash Value. The ACV is the first check your insurance company will give you. You will use it as your down payment. After E3 receives the ACV check, we will order, schedule, and produce your roofing job. 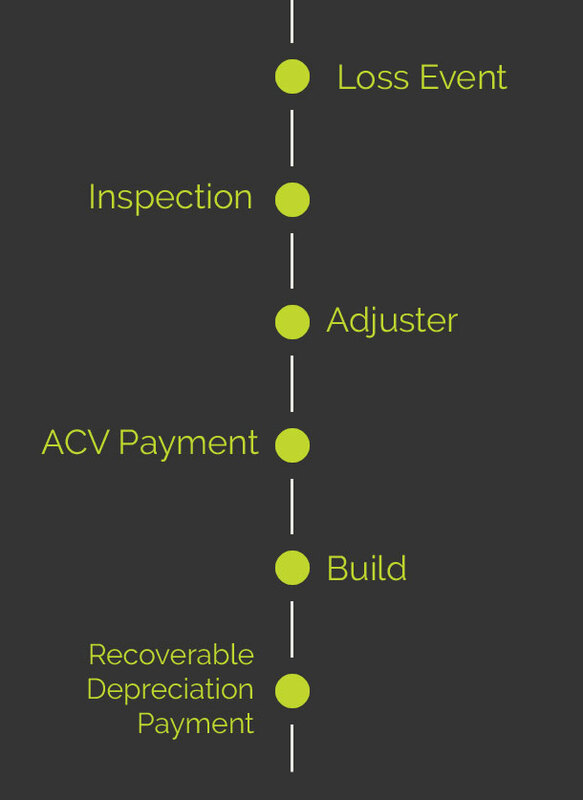 If your insurance settlement provides for recoverable depreciation, E3 will work with your insurance company to have the remaining funds released.